In Australia, the law states that whisky must be aged for a minimum of two years. But what happens to the whisky while it’s sitting in the cask? it already has an amazing array of naturally occurring flavours and aromas. But most whiskies get the majority of their flavour and character from the casks they’re aged in. Whisky casks can range in size and style. In Australia, it’s common to use American oak ex-bourbon barrels, as well as casks from the Australian wine industry (usually French oak) that have previous been used to age Apera (Australian sherry-style wine) or Tawny (Australian port style wine). Increasingly, Australian distilleries are also experimenting with other kinds of wine barrels, especially Shiraz and Pinot Noir. The kind of oak the cask is made from will have an impact on how it flavours the final whisky. American oak tends to lend flavours of vanilla, caramel, cherries and bananas, while French oak tends to have more tannin, spice and herbal notes. What each cask was used for previously will also have a big impact on the flavour of the final whisky. Virgin (never used before) oak casks will be intensely oaky, ex-bourbon casks will have lots of stone fruit and vanilla character, and ex-tawny casks will impart notes of dried fruit and Christmas spices, for example. How the cask is treated by the cooperage before being filled with new make will also impact the flavour of the whisky. Some distilleries have the barrels scraped and charred to create a layer of charcoal and caramelised oak, while others use the cask as-is. Finally, the size of the barrel will make a big deference in how the whisky ages over time. Most Australian distilleries use smaller 20, 50 or 100 litre casks to age their whisky. The increased surface area of the cask for every litre of whisky inside means the oak will impart more flavour in a shorter period of time, often resulting in a richly flavoured whisky in a fraction of the time of a full-sized cask. Australian distilleries have employed this technique with some cracker results, releasing whiskies as young as two years old that are dark, oaky and rich. Australia’s hot climate also helps to accelerate the rate of influence from the oak. Low average temperatures in places like Scotland and the mountains of Japan mean a whisky might need to age for at least ten years in a full sized cask before it’s mature enough to bottle. But in places like Kentucky and Australia with very hot summers, the oak influence is also accelerated. Tasmania is a bit of a middle ground – not nearly as cold as Scotland, but not as hot as the Australian mainland. 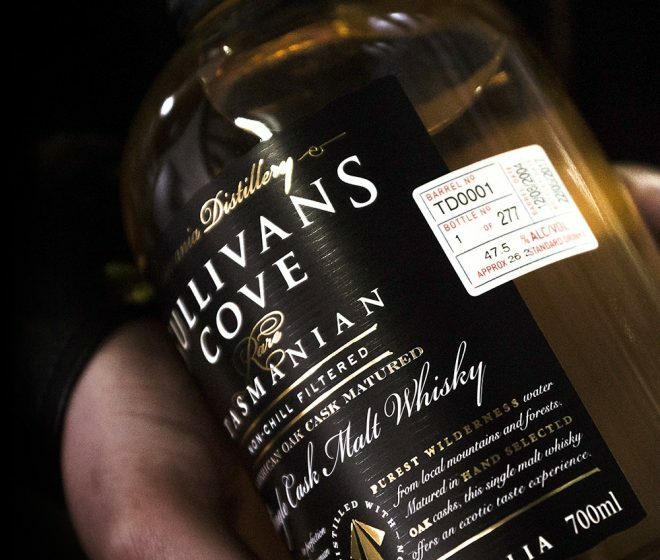 This is an important factor for Sullivans Cove where we’re able to age whiskies for well over ten years without becoming too oaky. While the flavours generated from the oak itself are a major factor in every whisky, it isn’t the only thing that happens in the cask over time. If a whisky is aged for many years, each summer, the increased pressure inside the barrel pushes the whisky into the wood grain, filling it with flavour. In the winter, the whisky filters back out of the wood, brining that flavour with it, while the char on the inside of the barrel also acts as a filter for harsher notes in the whisky. Other chemical reactions also occur inside the barrel such as oxidation, and the interaction of fatty esters, or flavour molecules within the liquid. Over a long period of time, these molecules will bond together to create new flavours and longer fat chains. This is why older whiskies tend to be creamier and more textural, with long, lingering finishes and a greater degree of complexity. the vast majority of our whiskies are aged in full-sized 200 and 300 litre casks. Our malts are un-rushed, allowed to mature slowly over many years in the unique Tasmanian climate. The result is a rich, complex and rustic style that lingers long after your glass is empty.